First things first – email marketing doesn’t work for everyone. It takes the right mix of content, target audience and approach to be able to generate interest in your product or service, and then turn that interest into sales. Miss out any one of these ingredients, and the chances are you won’t get the return you’re looking for. Yet when email marketing works, it works well…in fact, far better than most other marketing channels. And it can be as effective for small businesses as it is for large ones. VentureBeat reports email as being the channel that generates the highest ROI for marketers, and it’s estimated that there will be more than 3 billion users of email worldwide by 2020*. Combine this with the fact that it’s the preferred method of communication for 73% of millennials** (who have a spending power of $200 billion in 2017 alone***) and it’s clear to see that email marketing punches some serious reach and power. We know the potential is there…but how does email marketing actually work; and how can you convert these promising stats into real profits for your business? Purpose: Every email sent when email marketing needs to serve a purpose; whether that’s a promotional email offering a new discount or deal, regular emails sent to strengthen your relationship with your customers, or intriguing emails designed to spark an idea and drive your readers to another link. Audience: Your audience is key. You need to get it right and that means targeting your audience and adapting your emails effectively. Email marketing services can advise on where and how to obtain data lists that will enable you to achieve better results – the right emails targeting the right audience are more likely to lead to direct sales. Content: creating and sending personalised and tailored content is crucial for maximising brand loyalty. Any emails you send need to be relevant to the reader, and demonstrate that you understand what their challenges, needs and wants might be. So, how does all this lead to profit? With the right approach, email marketing can deliver some truly impressive results. But the measure of this success lies in delivering opportunities to do business, as much as it does in direct sales. Inbound enquiries are a valuable thing – and when combined with effective follow-up, they have the potential to drive your profits skyward. What if you’re seeing poor engagement from emails? Often when businesses embark on new email campaigns, they expect to see through-the-roof click-throughs and sales. And when this doesn’t happen they get disheartened. How much engagement you can expect to see depends on a lot of variables; you need to consider the type of product or service you are selling, the size of your target audience, and the email data you are using, not to mention a wide host of other parameters. The reality is, you may not see the engagement you want to straightaway…but you could do months down the line. And those leads will more often than not prove to be the most lucrative. This is where the value, and potential profit to be made, is found in email marketing. Don’t base everything on your metrics alone – your last email campaign might have achieved a record number of opens, but if it didn’t drive any sales for your business then what good are those stats to you? 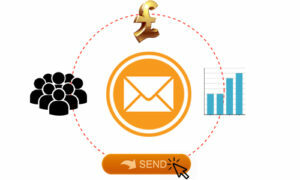 Want to find out more about how to turn emails into profit? Feel free to get in touch with us here at Essentiamail, so we can learn a little more about your business and what we can do for you. How many times would you call a prospect? What do your marketing words really mean? Is email marketing still an effective B2B marketing channel? Where’s your next quality conversation coming from? Would you ignore 60% of your contacts? Should you have your logo at the top of your sales emails? What does stock photography say about your business?